Grab & go street food? That’s common. Practically every street food vendors and peddlers provide plastic bags or styrofoam containers to accommodate take aways. For those who don’t just grab & go, some even provide plastic stools or simple wooden benches to sit and eat. 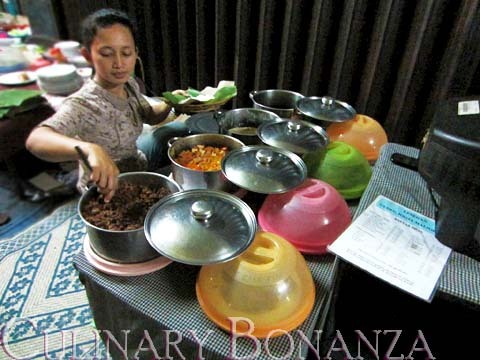 Now, what about lesehan street food? It is NOT non-existent, but still not so common here. If you’re still new to Indonesia, lesehan simply means sitting on the floor and eat, normally without the aid of cutleries, but using the fingers. Lesehan is commonly associated with the Yogyakarta, but it can also be found in some Indonesian restaurants everywhere. Due to hygienic reasons, lesehan is hardly found on the streets, unless you are in Yogyakarta. We should count our blessings, because many of our people are forced (not by choice) to eat lesehan on the streets. The casual and unpretentious setting of lesehan actually creates a somewhat intimate feel, especially among a group of people. For a brief moment there, we can take our ‘masks’ off and genuinely enjoy the nourishment without any insecurities that anyone will reproach or scrutinize us. I had only recently noticed the decade-old lesehan stall nearby, after living in Kota area my whole life! Turns out the nondescript niche only appears in the evenings, which I had actually passed so often on my way to Harmoni. One can only guess the stall’s boundaries as far as the straw mats are laid on the concrete walkway for pedestrians outside the closed shops. The food served here is unpretentious, yet delicious and reasonably priced (although it is on the pricey end for street food standard). The stall is named ‘Gudeg’, but they serve other Javanese fare as well like Soto and Sop Buntut. All of the items on the menu are not more than IDR 20,000. As I sat there, enjoying my plate of warm Nasi Gudeg, I watched the cars zooming past, the drivers and passengers oblivious to their surroundings. 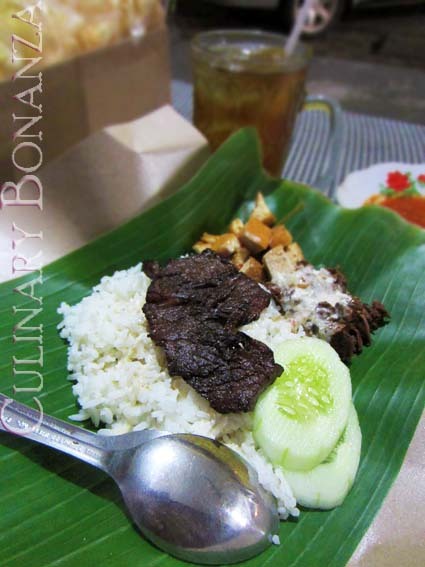 The fried-on-order Empal Daging (smoked beef) made the highlight of my humble feast. For once, I understood what it’s like looking up (literally) to the busy urbanites hustling their way through the traffic, trying to catch up with their hectic lives. As I count my blessings, I am grateful for the delicious warm food before me and the tattered layer of straw mat underneath as my cushion. 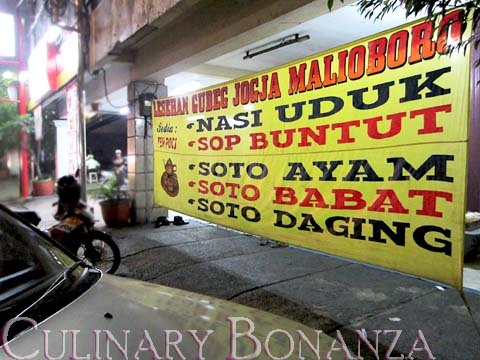 Lesehan street food can also be found at Blok M – Melawai, which I had yet visited. I shall make a point to visit it some time.